Christmas dinner is all about the roast turkey and I wouldn't do anything to the turkey other than roast it. However, I'm always looking for ways to use up leftover turkey after Christmas. I made this meatloaf with minced turkey for a Thanksgiving meal with friends and it worked really well as the main course, as it's easy to make in large quantities and you can make it ahead of time. But I think this would also work with finely chopped or even minced turkey if you have a mincer to use up the leftovers after Christmas. Or just make it for a regular meal! I was inspired by this recipe on All Recipes.com though I made mine slightly differently. Here's what I did. Preheat the oven to 175C. Heat the oil in a frying pan and fry the onion, celery and apple until just starting to brown. Transfer to a large bowl and add the breadcrumbs, cheese, milk, salt, sage and turkey mince. Mix well, then press into a loaf tin. Bake in the preheated oven for 45 minutes then slice into six to serve. The meatloaf was really good and even my boyfriend who has never had meatloaf before, and doesn't like apple or celery, said he liked it. It had quite a soft texture and I think could have used a little more seasoning but otherwise was pretty good. I served it with green salad and sweet potatoes with marshmallow. 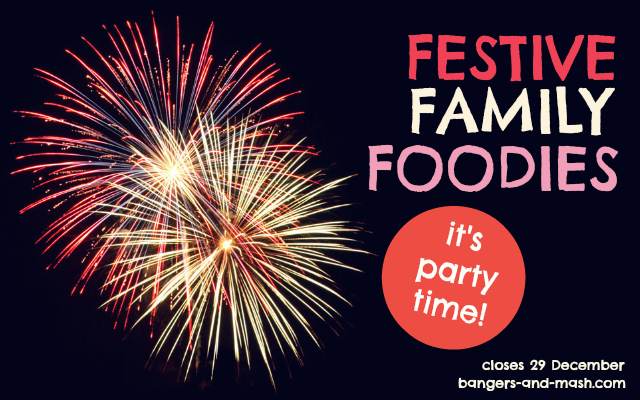 I'm sending this to Family Foodies, hosted by Vanesther at Bangers and Mash, and on alternate months Louisa at Eat Your Veg as the theme is festive food and you don't get much more festive than turkey! I'm also sending this to Credit Crunch Munch, hosted by Helen at Fuss Free Flavours and Camilla at Fab Food 4 All, as meatloaf is a cheap way to feed a lot of people - you can either use leftovers or mince is generally cheaper than 'better' cuts of meat.